Look for a jam. Something too tough to grind, such as a piece of glass, could be jamming the motor. Turn off the power and water, then unplug the disposal. (If it’s hardwired, turn off the breaker.) Remove the rubber baffle inside the drain-most just lift out-and shine a flashlight into the hole. Fish out the obstruction with a pair of tongs or needle-nose pliers. Turn the motor manually. You’ll need a hex wrench. 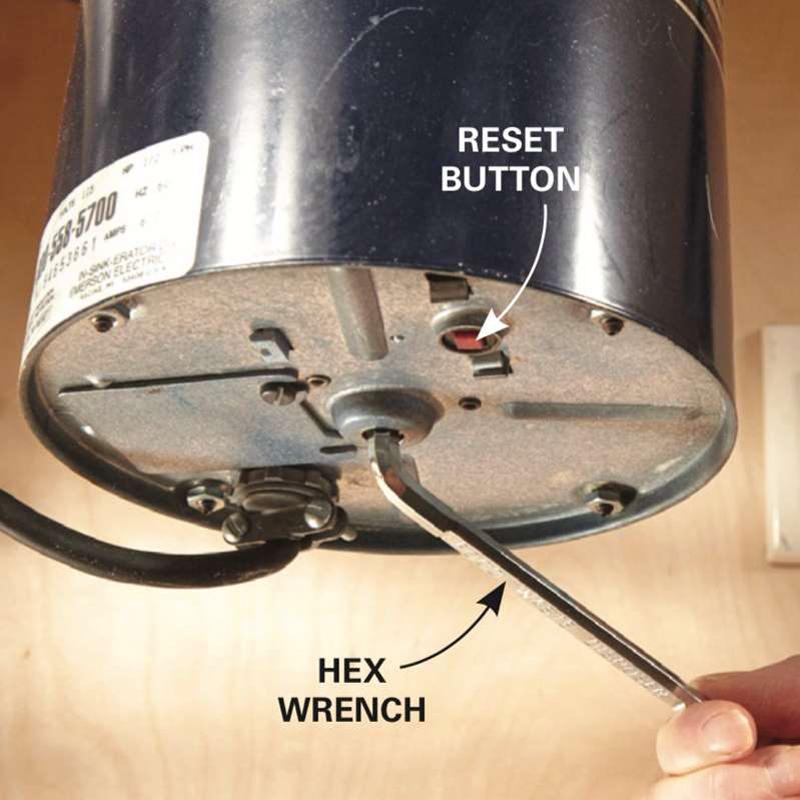 Some disposals come with one bent at a convenient angle, but if you don’t have it, you can buy one at a hardware store or use a standard Allen wrench. Rotate the wrench back and forth as shown above until the motor turns a full revolution, then remove the wrench and switch on the motor. Press the reset button. If your motor has overheated by working too long, wait five minutes for it to cool down, then push the reset button. (It’s usually located on the underside of the disposal.) The motor may also have overheated because of a jam. If the motor doesn’t start after manually turning it, try pushing the reset button. Everyone who’s installed a few disposals is aware of this mistake: Forgetting to remove the dishwasher knockout before hanging the unit. If you have a dishwasher, the first thing you should do after removing the disposal from the box is to punch out the knockout with a hammer and a screwdriver. Fish out the knockout by reaching down inside the disposal. You don’t want this plastic disc to be the first thing that the disposal tries to grind up!